This shot caught my attention as I was scrolling through the Flickr Group. The vastness of the sky and the clouds coming down from the top kind of like lightning striking the trees. Or, is it the other way around, the trees pointing upward and the light and clouds are being emitted from them? Then you add in the man walking his dog and it makes the scene feel even more expansive. When you’re looking at the man and his dog you realize that you’re also seeing great details of the mist from the waves hitting the wall along the shore. 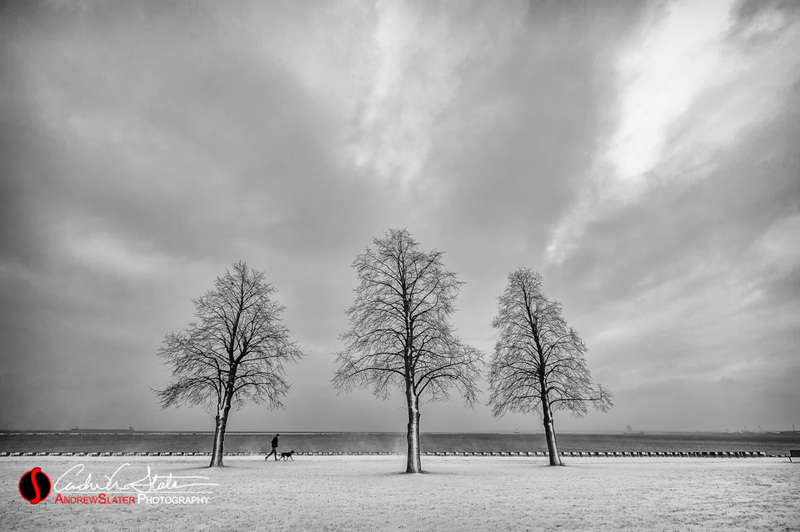 I also love how the snow on the trunks of the trees pulls the eye down into the grass to finish off our wandering around and in this scene along Lake Michigan in Milwaukee, Wisconsin. It’s a classic composition with added interest and the black & white treatment works quite well to make us feel the winter. Originally shared on the Photofocus Group on Flickr here. To learn how your work can be featured on the Photofocus, please read this article.